Because of unfavorable parameter during the solution annealing, too high temperature or too long holding time, strong scale layers can be formed. This scale layer is partly accompanied by stronger formation of scars. 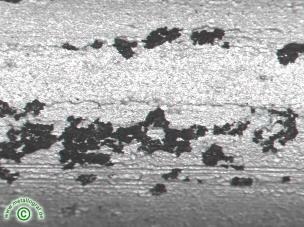 Unless by wrongly selected annealing parameters, a furnace disturbance yields the same defect picture. This strong scaling often can not be removed completely in only one pickling process. Rest of scale on the surface are then the consequence. It must be pickled a second time.